Athletes of the Week (AOW) are selected based on athletic performance and sportsmanship. 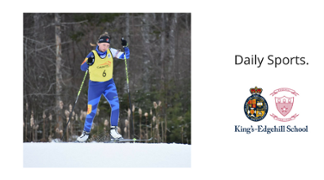 Positive sporting behaviour is valued at KES and integral to our Athletic Philosophy and School Mission Statement emphasizing gentleness and learning and dignity and respect. Junior Girl ~ Gala Holm (Junior Girls Basketball): In our most recent league game against Horton High, Gala had another incredible performance as she led our girls to victory with 33 points! With the win, our girls moved to 4-0 in league play with only two more league games to go before playoffs begin. Gala has made easy work of defenses this season and averages 25 points per game, but it is her budding leadership skills that have been most impressive of late. With a few of our key players returning from injuries, our junior girls are excited about their chances as we enter the final stretch of our season. Congratulations, Gala! Senior Girl ~ Maggie Baxter (Girls Prep Hockey) is having a year to remember! With only 11 skaters this weekend, our goalies really stepped up to make sure we were always competitive and could keep our best season yet, on a roll! Maggie had an incredible performance against the top ranked team in the West division, pulling out some huge saves to keep her shutout, eventually helping us hold onto a 1-0 victory and spoil the home team’s day. Maggie is the definition of Be More, and she will be missed next season, but we cannot wait to cheer her on at the University of Nipissing where she officially committed to play hockey and study Biology. Congrats, Maggie! Junior Boy ~ Quinn Emery (Wrestling) placed second on Saturday out of a pool of six competitors and second on Sunday out of a pool of three other wrestlers at two tournaments in Sackville last weekend. He is making an excellent adjustment to the higher weight class in which he is competing. His technical skills, fitness, power, focus, and most of all his work ethic and scrambling ability make him a formidable opponent in the 65 kilo class. The wrestling team is looking forward to seeing Quinn represent KES at Atlantics in our next event. Congratulations, Quinn and keep up the great work. Junior Girl ~ Maya Faucher (Junior Girls Basketball): In our most recent league game against KCA, Maya was a force! Despite going to the game with only 5 players, Maya led our girls to a 28 point victory as she poured in 26 points and managed to get through the game without registering a single foul (a rarity for her). Ever since returning to the hardcourt from an injury earlier in the year, Maya has steadily improved her game and has established herself as a leader both on and off the court. With a perfect 5-0 record, Maya and our Junior girls will host their first round playoff game here at KES in the coming days. Senior Girl ~ Téa Racozzi (Wrestling) dominated the weekend tournaments. She competed at Sackville High School on Saturday and at the Nova Scotia Open Provincial Championships on Sunday. Téa had a tough pool of six other wrestlers in her division on Saturday and won GOLD with technical skills and her usual grit. As our team captain, she provided an excellent example by showing dignity and respect towards her opponents, and by never forgetting to have a fun time. In addition to her GOLD medal, Téa led the Senior Girls’ team to a second place finish, missing first by one point. She also earned MVP of the tournament via a vote from the other coaches. This followed an impressive Eastern Canadian Championship win, on the previous weekend at UNB, where she was certainly one of the top wrestlers in the under 21 age category event. Congratulations, Téa! Senior Boy ~ Callum Lovelace (Wrestling) earned a GOLD medal at Sackville High School’s annual tournament on Saturday after out-wrestling very tough competition from five other athletes from Nova Scotia and New Brunswick. His technical skills are increasing with every match, and he approached the tournament with a positive attitude. Great work, Callum! 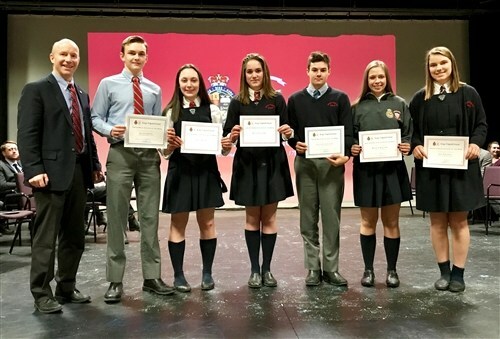 King's Edgehill School understands that some students thrive as part of a team, while others prefer to compete individually to improve their personal bests. We value both types of competition. Download our Athletics PhotoJournal to discover more about our athletics programme.